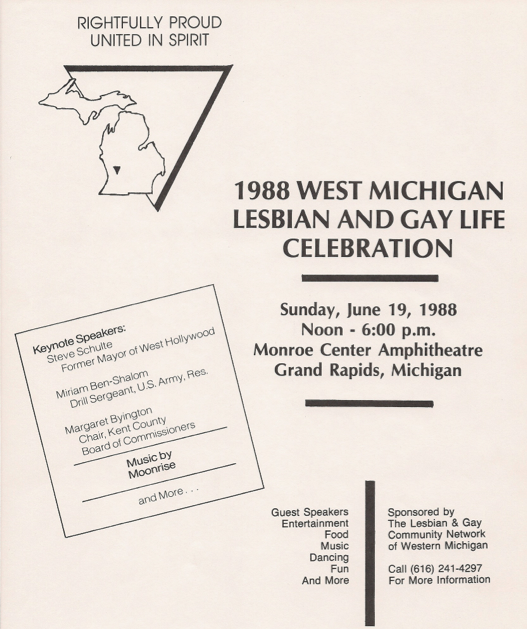 Despite the lack of government support, members of The Lesbian and Gay Community Network of Western Michigan and other area LGBT groups organized the first Pride Celebration in Grand Rapids in 1988. The video below is 90 minutes of the first ever Pride celebration in Grand Rapids, which includes comments from the stage, interviews with organizations tabling at the event, music and even footage of the spiritual violence that was perpetrated against those in attendance by a group of self-proclaimed Christians who tried to disrupt the event. This entry was posted in LGBTQ Movement and tagged 1988 Pride Celebration in Grand Rapids, Grand Rapids Pride. Bookmark the permalink.